Personally, I do not like the way free shares were awarded to the CEO and his director, but I guess he also did it to protect himself. Another person that comes along may be more professional and deeper pockets than KYY. Airasia is going to be fine. They have positioned themselves to grow when there's space for them to. Although the leasing of planes that they have sold are committed, the commitment is not long. In any case, the way Airasia positions itself, it will need the planes anyway. It has rooms to grow in Philippines, India and even Indonesia and Japan. Whether those new additions will translate into immediate profits is however arguable. Hence, comes to the bigger issues. I know where and what Airasia is thinking, to an extent. It wants to be the dominant ASEAN airline - forget me saying about low costs airlines as even in Malaysia one can see that they have 58% market share. If that is the number, this means low costs airlines is now mainstream, and full fledged is going out of mainstream. The way Airasia positioned that, to me - in the short run will have some issues. If one is to buy tickets, pricing wise, the competition is scarce especially in Malaysia. To fly to Singapore from KL though, we have additional options for cheap fares. However, for Malaysia, that option is almost now negligible. Airasia is actually fighting against Airasia in terms of pricing. For example, if I want to fly from Penang to KL around 8pm to 10pm, I have options in terms of pricing - all from Airasia. If I go out of Airasia, then I have to pay considerably more. Hence, Airasia has positioned themselves as such. It has crowd out Malindo and MAS. It plans to also crowd out others in other countries that it operates in - such as Thailand, maybe Philippines in the longer term. For Indonesia, it will be tough as Lion Air is very strong despite the sad event last year. For 2019 and 2020, what used to not be its strategy for last 2 years, it has brought back into decision. Hedging fuel price. Hence, so far so good. It has hedged 52% of fuel for 2019 at USD63 and 40% for 2020 at USD60. That, by itself shows that Airasia knows what is the price point, people will be willing to buy its tickets. Hence, by eliminating some of the uncertainties in costs, it can strategize better. Now, then if Airasia is doing that well, why is it announcing such a bad result. To me, it was triple whammy for the last quarter. What supposed to be the most promising quarter usually as it is holiday period, they turned in losses - massive. The first thing was fuel costs. Something went wrong. I know they did not hedge as at last year's policy but it was USD91 jet fuel. The highest Brent crude went was about USD80, then towards November it went down to as low as USD52 in December. I also understand that Airasia sells a lot of their tickets upfront but at USD91 is surprising. Second thing, of course is the weak currencies throughout ASEAN. A lot of the costs are in USD - from lease to fuel to interests payment. The third thing, for Airasia is the lease costs which it has to now bear because it has sold a substantial number of its planes and need to leaseback. These are costs which will stay. I do not see our ASEAN currencies to be significantly stronger in the next few quarters. Neither will the lease be going off soon. However, one BIG thing which I do not put in as a whammy is the weak pricing of its tickets. Its RASK is 14.82 sen for 4Q18 against 15.46 sen in 4Q17. It can say that its total available seats has grown substantially by more than 20%, but that drop is also bad. Suffice to say that the load factor has also gone down from 88% to 84%. As mentioned, usually, this is the period where people travel - many a times for leisure. Hence, its pricing is now elastic, significantly elastic - which is no good. Perhaps, Airasia for regionally has no longer become the airline for leisure but business travel has become a big part of its business. When people take off for holiday or stay at home, its yield suffers - as they have become leisure traveller rather than business traveller, perhaps. I may be wrong in some part - but the argument of huge disparity of income is potentially true. The richer ones are travelling to Europe, or Japan. The poorer ones are no longer flying for holidays or maybe very petty when comes pricing. No good for the economy. Airasia will overcome that in the longer run as it now understands demand and readjust. It has readjusted partially, as mentioned above in hedging the fuel price early. But the poor spending behaviour shows that people are very timid when comes to purchasing. What I fear is that the trend that Airasia has shown being a regional airline is that not even Malaysia, regionally people are not having that much freedom to buy. I have seen in some of the results, not even on Airasia but others. The larger scale of things, we do not know how big will the impact be in the shorter term future. I have mentioned about what's dangerous in the near term, but this is one which is really I am seeing signs that shows what is potentially coming. I was born and grew up from a "Project Perumahan Rakyat", one of the first of its kind during the 70s, when government during then was trying as usual solving housing problems. My parents was paying about RM36 a month to be able to rent the one bedroom 400+sq ft place which later on we were allowed to own. That by itself is a rent to own scheme. I know what B40 is about and obviously have gone through life being in that category. During then, the term B40 did not exist but in my community as a child, my grandmother was always careful that I do not take the elevator alone as there are a lot of drug addicts in the area where I dwell in. The place that I stay, we cannot fix a ceiling fan as the height of the unit is only about 8 ft. Among some of my neighbors, there could also be families with 10 people staying in a 400sq ft unit as during then and now, people are just hoping to have a roof over their heads. Of course, over the period I have studied in a good public school and I have always been immersing myself with books and knowledge. My family as I can say it take books as our source of knowledge. I would claim that my fondness on numbers and later on finance and investment since young comes to the appreciation in understanding business. Of course, living in Malaysia, we have to understand politics and constant pressure faced by politicians. I am still learning and this is one area which I constantly overlooked. 2018 of course was unprecedented, and I do not need to say what happened as from May until now it is already 9 months. As in every Malaysian, we have to go on with life. We have to make Malaysia better under the constant pressure from new economic powers further from Malaysia or even among our neighbors. Today, North Korea's Kim Jong Un is talking to Trump on disarmament of nuclear weapons in a country called VIETNAM. Having that discussion in Vietnam itself is historic as who would have thought of that discussion being held in a country that just gotten itself out of war not too long ago. Malaysia is facing new pressure from these type of countries, never mind our four neighbours, Singapore, Thailand, Philippines and Indonesia. In that, Malaysia has to move faster, smarter but still carefully. In my many discussions with businessmen who do business in Vietnam, Malaysia still has many advantage against that country. But yet, we are still competing against them on many fronts. The new government in addressing the B40 (rightly so), still has to grapple with bringing the country forward. In that, the budget, expenses, policies and later deliveries have to right and precise. To bring forward economic comfort to the people, many forgot that one, as a country, we have to fix the economy first. With that, together we have to address the plight of the people. Of course, today the challenge faced by many government of the day is to fix the disparity of income. This is the flaws and product of globalism, where a particular company thrives and become stronger while few competitors survives. Example, how does one address a monopoly or soon to be of Grab, Lazada et.al.? We complained about the taxi license holder of the past but these are one company dominating an important space on the new economy. The new government, unfortunately, with the manifesto, todate it is more of a filling the potholes from the promises provided during the election. Some of the people that I talked to, still felt that Malaysia has not gotten itself out of the election fever. True enough, in one seminar that I attended recently, one of the politician turned government hence policy maker today still talk about the triumph of May 9 - 9 months after. Since liberal democracy has been proven to be a governing model, it has been seen that one of the way to fix the economy is to promote capital markets, direct investments and entrepreneulism. Malaysia, in that respect practices open economy. Our DNA has been about getting companies to take up risk and we encourage them by giving incentives. When companies profited, we can once a while complain but of course in the process, we see better Malaysian entities come out of it. In fact, our open investment policy also helped non-Malaysian companies to thrive out of Malaysia. If one goes to Penang or even Johor, we see many, but we just do not realise it. We helped many non-Malaysian companies to be successful and we should be proud if it. However, our bigger hope is to see Malaysian company that is able to compete globally. The elimination of tolled highways is one of the promises among the many promises. I however felt that it is an over-promise which has not been studied carefully. If we put it and give a simple question to the masses, they of course will not want to be paying toll. Nobody wants to pay anything especially when the B40 and M40 earn below RM8500 household income. However, the past government, since 80s i.e. Penang Bridge have already started privatisation of roads whenever we feel there is a need to develop infrastructure. Fast forward today, that perhaps been slightly overdone - but it is not easy to reverse a strategy that has been created for so long. In getting private to invest and charge, our budget on development has been allocated elsewhere. More recent analysis has provided that to buy out all the concessions it will costs RM150 billion. The government has talked about RM1 trillion debt. While RM1 trillion is deemed high, another RM150 billion is not helping. Every year, in our budget, Malaysia for quite a while has not been putting that much on development expenditure as our operating costs has been a bigger problem. We tried to solve that through private-public partnership (the 3Ps). It is a good effort, but as usual to make that happen the one that takes the lead i.e. PUBLIC has to make themselves consistent i.e. then only the companies will be comfortable. While in my past article, I am supporting the purchase of Gamuda's toll concession assets, to do it much more aggressively on several others is a dangerous precedent. We just do not have the capacity. The public, like it or not has to be educated, just the same where they have to be educated on personal financial management - to fish rather than to be given fish is an old proverb but still relevant. This toll topic is hugely complex and I believe only a small percentage can comprehend, but nevertheless a policy has to be clear and we have to stick to it. Otherwise, fewer companies will be willing to invest and that could present a bigger PROBLEM to the country. Prime Minister's Department made an announcement where it is in negotiation to buy the concession owned by Gamuda, and this is probably the most rational. Gamuda as mentioned owns 44% of LITRAK which has LDP and SPRINT under that vehicle, 50% of SMART in partnership with MMC, and 70% KESAS in partnership with Selangor State. These highways pass through the most populated areas of Klang Valley, hence by buying them, it probably sends a message that they are doing something to their promises. It would impact the most number of people although we can say that whatever that is forgone towards development in the rural is provided to the urban. The fact of the matter is that, cost of living is most dearly felt in the urban area than the rural. Most of Gamuda's related highways except for SMART is highly profitable. Most of those tolled highways additionally are left with short tenure, which makes it more reasonable to buyback. Costs to the government will not be as high. LITRAK's highways will end by 2030 while KESAS should have ended by 2024. I believe SPRINT should have ended by 2034 to 2036. The most significant piece of the proposal is that the government is exploring to impose "congestion charge" pretty much like Singapore's concept - without the smartness yet, as Singapore's concept is charged based on traffic, where it is proposed for the current charges is charged as congestion charge for 6 hours during the peak hours. Between 11pm to 5am, it is proposed for non toll charges while 30% discount will be given for off-peak times. This concept is a good idea as it probably disperse traffic more evenly, hence basically asking companies and people to relook at the working time. It is current, as most ideas are towards flexi hour working, which to me brings even more productivity than not. A simple fact that can be argued is that with people spending less time on the road as well as better utilisation of mass transportation services, it by itself already causes better management of facilities and time. Before this, I have always wanted to suggest towards creation of a "transportation fund" as part of the ways to address the promise towards reducing toll highways. It seems that this one is a way to start. The collection from the full fare in peak hours and further 30% discount is a model that can be worked on. To impose congestion charges even on roads that are non-tolled at the moment will not be a popular idea, but that is one which the government must look at holistically, as in the future our KL city will be almost deadlocked, if we do not look at the revise transportation model. As it is MRT3 is being postponed and the current situation will not allow the government to even consider more tolled roads. The transportation fund that I have thought of can be used to buy up some of the tolled roads as and when they become available for purchase. The government need not buy them off in one go but it can be done in stages. One of the entity that government could work with is Khazanah and I believe Datuk Shahril the current CEO of Khazanah should be experience enough to look at this. Why Gamuda rather than PLUS for example? If one looks at the highways that Gamuda has control of, they probably are less affected by gearing. LITRAK's debt for example is about RM1 billion. And if the government is to take over the concession, they can also take up the debt. The PLUS one is much bigger, which I believe the debt through bonds is still around RM30 billion. 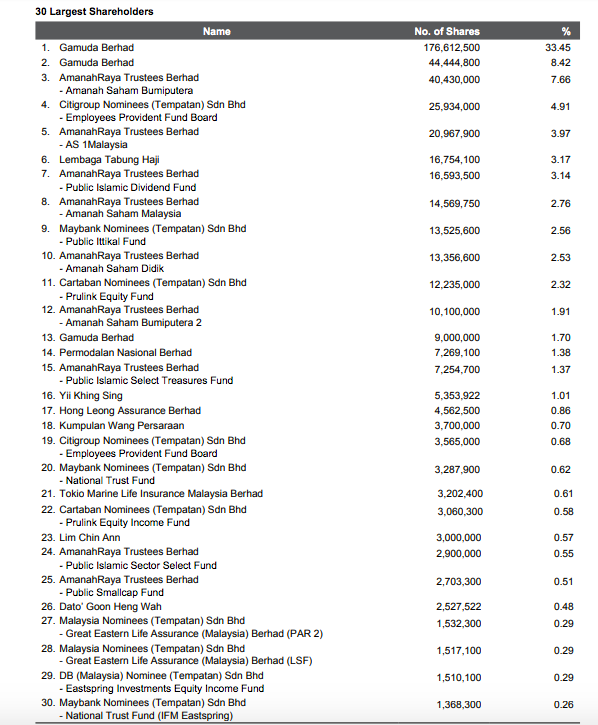 Moreover, who is to compensate the EPF's contributors whom have funded the purchase of the concessionaire 8 years ago at RM34 billion enterprise value? The ones owned by Prolintas under PNB are also more challenging as we know PNB is an investment arm for a large part of the community and they can be sensitive. Many of PNB's highways are also just breaking even. And they are still building 2 new ones - DASH and SUKE - if I am not mistaken. As above mentioned, LDP and KESAS should be the ones that are more compelling to be purchased back and show that this is the model to go forward towards highway or road charges. I believe the purchase of the concessions of LITRAK, KESAS, and SMART should be at fair value with some small discounts. 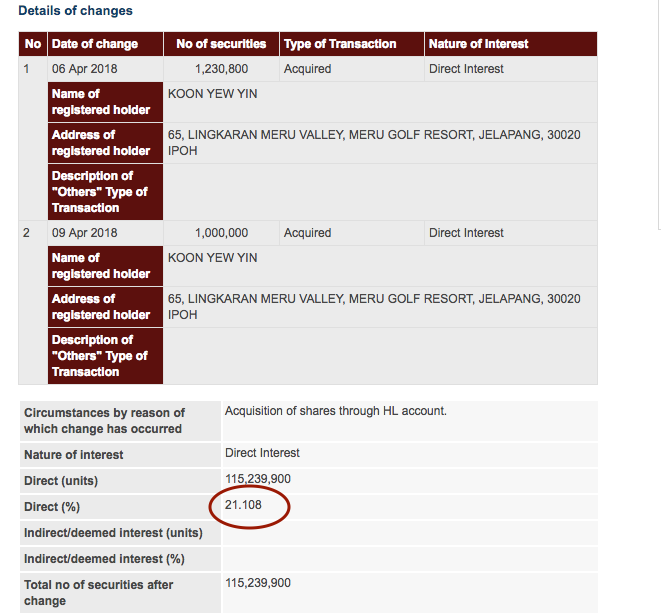 A look below shows that the majority of the shareholders for LITRAK for example are owned by funds. 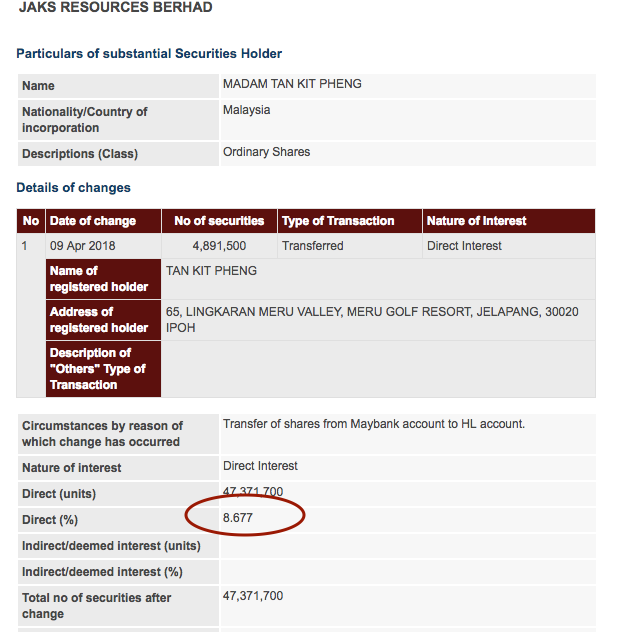 I believe except for Gamuda which owns 43.58%, funds own almost 50% of LITRAK. In buying up assets especially on the part of the government, one should be very careful as it cannot afford to be seen as overpaying while the capital markets be seeing it as non-punishing towards them. A small step that is taken wrong would impact the market as well as the economy on a macro level. On whether this is value depreciative towards the other highway concessionaires especially like WCE, Ekovest or even Taliworks, I think it should not. To make the transportation fund model (as above) works even better, I suggest for incentives through capital markets such as the ones like Real Estate Trusts (for highways) to be created. From this, renegotiation on toll rates could also be initiated as the companies that are incentivised through various means may even reconsider the pre-negotiated contractual rates. A simple example, the Transport Fund could invest into the listed highways and from there push for "congestion charges" type of model from within. Highways that do that could be incentivised through various means and that could also include maintenance contracts for other non-tolled roads. In reality, as I see it, after the 9 months in power, the current government is getting a better hold of the situation and understands both segment - people and market economy - much better. As it is, one can see that remarks that are made suddenly has been much reduced. They also do seem to understand that to elevate the current situation, it is not just by giving but in its entirety: the people's cost of living, the business sector, the general economy are intertwined. Even this time around the Gamuda's situation is handled better than the one when part of the package for MRT2 was terminated suddenly. I am actually seeing more positive signs last few months except for the constant pressure to win by-elections. Since my purchase of Bumi Armada two days ago, CIMB came out with a downward revision of the target price of Armada from 70 sen to 30 sen. If the summary that TheStar is made correctly, I feel that it is weird that CIMB has taken the probability of a right issue to be called by Armada at 70% and it will stay status quo at 30%. Hence, based on that probability the analyst downgraded the call to 30sen.